Live poker has variance just like any other form of poker. The thing about live poker variance is that it's much slower and prolonged than what you'll normally encounter in online play. With online poker, a player can swing up or down 5-10 buy ins in a single day. These types of swings are very uncommon in live poker due to the much slower pace of the game. Depending on the type of game that you play, your skill level, your style of play, and what limit you play, your live poker variance can mean small swings on a monthly basis or huge swings on a weekly basis. Live poker players tend to worry much more about their swings than they really should, and this is a product of the environment. When you are playing poker online, you don't really have the money in your hands. You don't feel the losses as much because everything is virtual. In live poker, however, a buy in lost means you need to reach into your pocket for another $200, $500 or $1,000+. These types of losses are very real and will affect almost any player. In NLHE games you are always going to run into more variance than what you'll find in limit games, and for very obvious reasons. Don't expect to run into a whole lot of deep thinking players in these games. As a result of all of this, you should not have many big down swings. Most $1/$2 NLHE players will have normal swings in the range of 1-3 buy ins. Though 5 buy in swings are definitely going to happen from time to time, they aren't all that common. It's unlikely that you'll frequently lose more than this if you are a sound winning player. If you are going on bigger swings than this at $1/$2, you may want to re-think your live poker strategy altogether. In the end, it gets no easier than this limit when it comes to live poker. These two limits were lumped together, though they most definitely could be separated. The reality is that a very small percentage of the live poker population makes $5/$10 their regular game for a number of reasons. If you play in Atlantic City, Las Vegas, California, or Florida, you'll find some exceptions to this rule. In these games, swings of 1-5 buy ins are the norm. 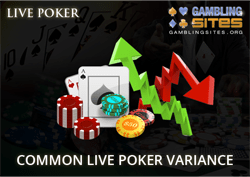 The live poker variance will always increase as you play higher limit games and games with tougher levels of opponents. Variance is going to be diminished from the perspective of buy ins when you are playing in deeper games. For example, a $1000 max game at $2/$5 will have less buy in variance than a $500 max $2/$5 game. This is because many players will buy in short and for under the max which will make it more unlikely that you will be in 2k+ pots. One of the biggest adjustments and learning curves for new live poker players is being able to adapt to the constant swings of real money. You'll likely be thinking about just how long it is going to take for you to recoup those losses. Because live poker is slow, you'll be left with even more time to bemoan your losses and to contemplate how just one faded flush card would have turned your night around. In live poker it's even more important that you are able to let the losses roll off your back. A lot of players will stress out over their losses when playing live because everything feels so real. Some of the common reactions to negative variance include frustrated play, angry/aggressive play, or simply running to casino games to try and get even. Looking at things in a one session vacuum at a time is very easy to do in live poker, but it needs to be avoided. The more that you realize that swings are going to happen and that they are very normal, the more likely that you are to be unaffected by them. If you play online, make sure to check out our article covering online poker variance.